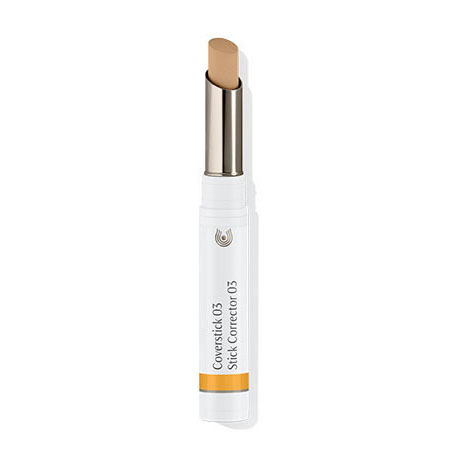 Coverstick conceals blemishes and imperfections while soothing and supporting the skin’s natural processes of renewal. Skin becomes imbalanced for a variety of reasons, including hormonal shifts, stressful conditions and a change of climate or season. Coverstick offers highly effective skin care that hides small imperfections while calming and nurturing skin. Formulation: Coverstick combines nurturing botanical extracts with moisture-retaining precious oils and waxes to conceal blemishes as they heal. Tea tree and manuca oils reduce the appearance of blemishes while extracts of rose petal, calendula, carrot and anthyllis soothe redness. Mineral pigments blend and conceal for an even complexion. Skin Condition: For all skin conditions. Especially helpful to blemished skin. Coverstick is easy to use, blends in well and covers dark spots and uneven skin tones. I like this product, it works best with the Clarifying Day oil. It does a good job at concealing my breakouts and keeping them from getting out of hand. I have been using this coverstick for many years and love that it 1) uses natural ingredients that do not dry out or irritate my skin and 2) is effective at evening my skin tone and covering blemishes. I do find that I need to protect this product from high temperatures, however, which is difficult during New Jersey summers, and that the stick can break under excessive pressure, especially if it is too warm out. I have tried other products and brands and keep returning to this one because it is my favorite. I love this product! Great for covering up blemishes, under eye concealer or blending for all over coverage. I love the smell too! Dr. Hauschka service was very good, and the shade of the coverstick is right for me. However, I thought that I was ordering the kind of coverstick that I have been so happy with for years, which dispensed small dots of cover through little holes on the head of the wand...oh well! Sorry to hear you are not 100% satisfied with your purchase. We believe the item you are looking for is our Makeup Concealer.If you'd like further assistance please give us a call at 800-247-9907 9am-noon and 1pm-4:30pm Eastern Standard Time, Monday through Friday. This works but the coverage could be a little more and a little darker for the darkest color. Wonderful daily coverage. Not too thick or thin. I have fair skin and use the Coverstick 02 - which I absolutely love. The texture is creamy but not too thick or oily. It blends in well and offers great coverage. I've been buying this product for about 3 years now with no plans to change! I love the color stick. It is not too heavy and blends really well. Best for under eyes on this 54 yo! I have tried several coverups but they always settle in the creases under my eyes, or they just don’t cover the dark circles. This cover stick is the best. It blends perfectly and is smooth but not too creamy. I love it and will use it from here on out. Love!!!! Covers well. If only you could make a concealer that works as well. Your concealer is the only thing I do not like and I have purchased both types available. I have many allergies and am thrilled that I found a coverstick that works well without a negative reaction. The color is good but every time I used it I would end up with a small pimple in the spot I put it on, by the end of the day.. I think because my skin is really dry the coverstick made me break out. It isn't moisturizing but rather drying. Better used for people with oily skin. Goes on smoothly and covers well! I bought this cover stick for the first time now and I am satisfied overall. I think I got the wrong color (02) which seems to be lighter than my skin tone, so I would like to replace it for 03. The tube lasts long and the cover stick is creamy, so it lasts for awhile too. Wider color range would be better though. I think I will order the other shade as well for the warmerr months. This lighter shade works better when I do not have a tan. 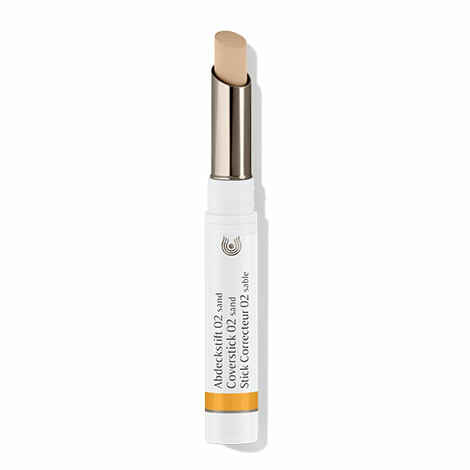 The Coverstick is not the same color as Dr. Hauschka's Concealer! I use 02 Concealer and bought 02 Coverstick, but the Coverstick is much lighter. It leaves white splotches on my face that are more noticeable than my blemishes! Also it's a little oily for my combination skin. I think it would work well on someone else that has a dryer, lighter skin color. However it's not irritating at all, well, besides needing a coverup to cover it up! Goes on smoothly and blends well. The skin around my eyes greatly appreciate this beautiful product. I have been using Dr. Hauschka products since the early 90s and my favorite product is this coverstick. I have combination skin with a oily t-zone. I live in a humid hot state and the coverage and staying power is amazing. The only con about this product is the choice of colors. Your in trouble if you aren't fair skin. It would be great if there were more color options. I absolutely love this coverstick, it is a true coverstick and does it's job, the only way to make it better is to have more of it in the tube. It's the exact color of my skin. I always thought going lighter was the way to go but now I don't anymore. The coverage is thin, but adequate for small imperfections as advertised. I ordered color 01 natural/fair, because I have fair skin (blue eyes, etc.). However, the color is quite a bit lighter than my skin, which is unusual for me. I've only had it for a few weeks, so I'll see how it performs during different seasons. The product has a pleasant texture and smell. So I have sensitive acne prone combination skin and was using this on my acne and dark spots/ under eyes. Color going on was fine but this product wore away after an hour and unfortunately didn't last. For the money, I expected more. Skipping. Mid-30s with oily yet highly sensitive skin. I get hormonal breakouts and a few random ones. This formula takes care of them all. I feel or see a pimple or deeper blackhead starting, pop this on (press and roll) 2-3 times a day and virtually all signs are gone! The few that do appear last only a day or two- they just dry up and leave no red marks/scars. Love love love! I love this product it goes on nicely and covers up my blemishes. I'd say the colour isn't quite right for my skin but with powder over it it blends in well. Coverstick is a fabulous product. Been using it for YEARS. Covers any type of skin anomaly and can be used for dark circles. Blend well. Wish you would please BRING BACK YOUR BRONZING POWDER! Dr. H is THE BEST! I have been using the Coverstick product for years and love it. The coverage is wonderful, especially for blemishes, and the color of 02 matches my skin perfectly. I trust Dr. Hauscka products and clean quality. Definitely recommend this cover stick. Very gentle. Good coverage. I dab it with my finger and apply to redness and blemishes and that's all I need! The color and coverage is perfect. I love the "transparent" quality of the Coverstick. Apply Coverstick at the first sign of a blemish and reapply as needed throughout the day. Use fingertip or make-up brush to smooth and blend. Make-up may be applied subsequently, if desired. Coverstick is available in three shades to suit different skin tones. For blemished skin we recommend a program with Cleansing Cream and Clarifying Toner or Facial Toner. Clarifying Steam Bath followed by Clarifying Clay Mask deeply cleanses. Sample products for oily, blemished skin with the Clarifying Face Care Kit.